The cast and crew behind Empire Strikes Back sport the original parkas. Photo: Lucasfilm Ltd. The fandom behind the legendary Star Wars franchise is mythic in its affinity for collecting memorabilia. And nothing illustrates that point better than a trend that’s taken off in recent years of collecting special items made for the cast and crew behind the original films. 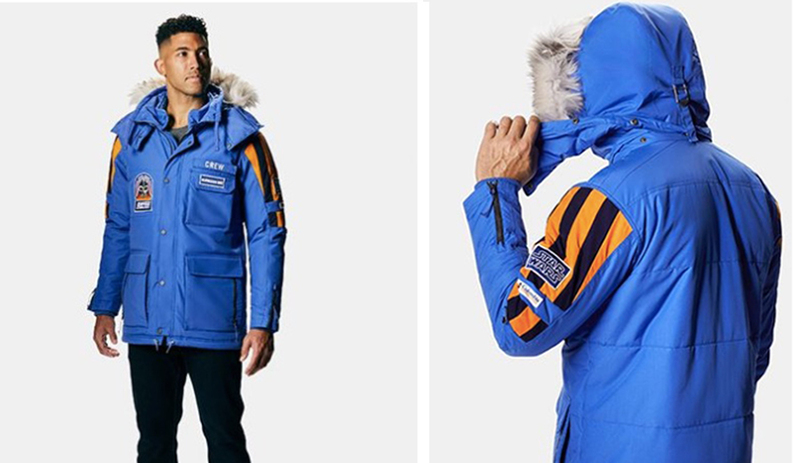 Among these sought-after items, “the grail among grails,” according to a February article on StarWars.com is the “Empire Strikes Back snowsuit that was custom-made for the crew.” And seeking to leverage Star Wars‘ popularity, Columbia Sportswear is releasing a limited edition jacket this month based on those worn by the crew behind the second film in the franchise. “The Empire Strikes Back was filmed in Finse, Norway, a remote town on the railway line between the cities of Oslo and Bergen,” the StarWars.com article explains. “Finse was the perfect location for the planet Hoth, as during much of the year it is buried in snow and surrounded by breathtaking mountains and glaciers. On December 7th, Columbia will release a modernized blue parka complete with Star Wars, Empire Strikes Back, and “Norwegian Unit” patches. This is the most recent in a series of collaborations Columbia has done with Star Wars, following last winter’s release of outerwear resembling Luke Skywalker, Princess Leia, and Han Solo’s jackets from Empire Strikes Back. In 2016, Columbia released a jacket based on one in the more recent Star Wars film Rogue One. Looking to be the coolest, or maybe nerdiest, guy or gal on the ski hill? Learn more here.